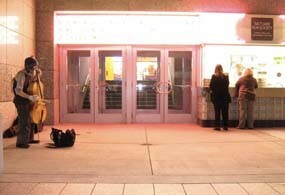 It was 9:35 p.m., and a couple came up to the ticket window at the Broadway Centre Cinemas asking about the 9:30 movie. She was giggling because she had just realized that typing “666” into her cell phone spelled “mom.” LOL. It also spells “Moo,” but I guess satanic cows aren’t funny. She told the ticket seller that she and the boyfriend were having an argument. She thought that if the newspaper said the movie started at 9:30 this meant the previews started at 9:30. Her boyfriend said this meant the movie actually started at 9:30 and, therefore, they were five minutes late. There was more laughter, a few shoves and then she jumped up and got a piggyback ride into the theater. Sometimes life looks so easy. I was sitting outside of the Broadway and wasn’t in the mood to see a movie. Instead, I paid $1 for a private cello concerto. As the couple bought tickets, the cellist played “The Star Spangled Banner” transitioning the song in the 12 keys from C and C-sharp to B and B-flat. These weren’t the first words he’d said to me, but it was the first thing he’d said in awhile. I’d shown up to the movie theater just before 9. 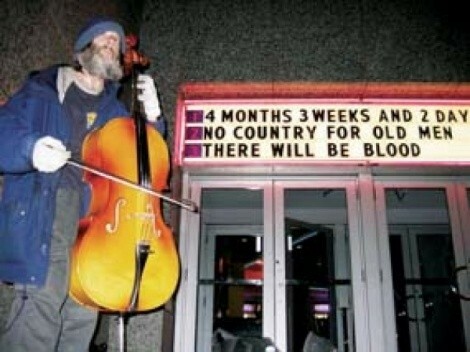 Like I said, I wasn’t going to the movies, I was looking for this cellist whom I have seen play around town for as long as I can remember. Usually, he is standing outside wherever there is a crowd. More reliable than a letter carrier, he’s been in my life outside of Jazz games, bars or the Capitol Theatre, regardless of weather. More often, though, I see him at the Broadway. I’ve seen him and I’ve heard him, but I’ve never talked to him. I hate to say it, but it’s because, while he may have a home, he looks homeless. His music is beautiful, but whatever he is going through seems the opposite of his sound. 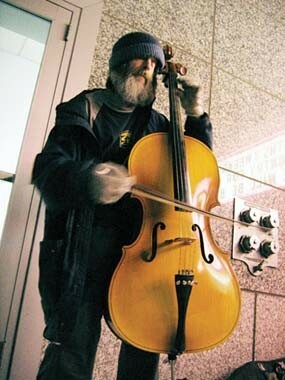 He said his name is Eli (pronounced Ell-e) Potash, and he wanted to make it clear that he is not a cellist. “I’m not a good cellist,” he said. “I am also not a bad cellist, but I am not a cellist.” Eli is a bass player. He attended the Brussels Royal Conservatory of Music, and he’s also played bass in the Rhode Island Philharmonic Orchestra. He was gone for about 13 of his 15-minute break and, when he came back, I had more questions. As he unzipped his cello from its case, he held up his hand and said, “No more talking now.” I didn’t take this a slight. I don’t talk at the symphony. I don’t talk at the opera. This was Eli’s stage, and I shouldn’t talk here. In between songs or customers, Eli walked around and picked up trash so his stage would be clean. Then, right when the rockets’ red glare was about to burst in mid-air, he stopped playing and told me about his “Star Spangled Banner” arrangement. “It’s better to talk,” he said, “than to answer questions.” He talked about music theory and said he’s not as antisocial as he may seem. He said playing on the street has him “closing in on happiness.” I didn’t ask him why he left the philharmonic, and he didn’t have to answer. It was better to listen. Sometimes life may not seem easy, but there is beauty on Broadway—if you listen.